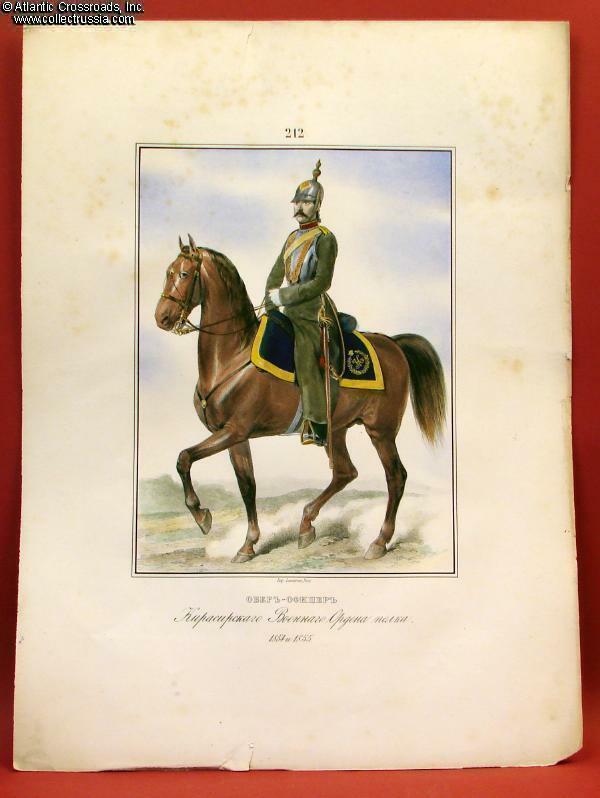 Russian Military Print #212, Reign of Nicholas I (1825-1855). 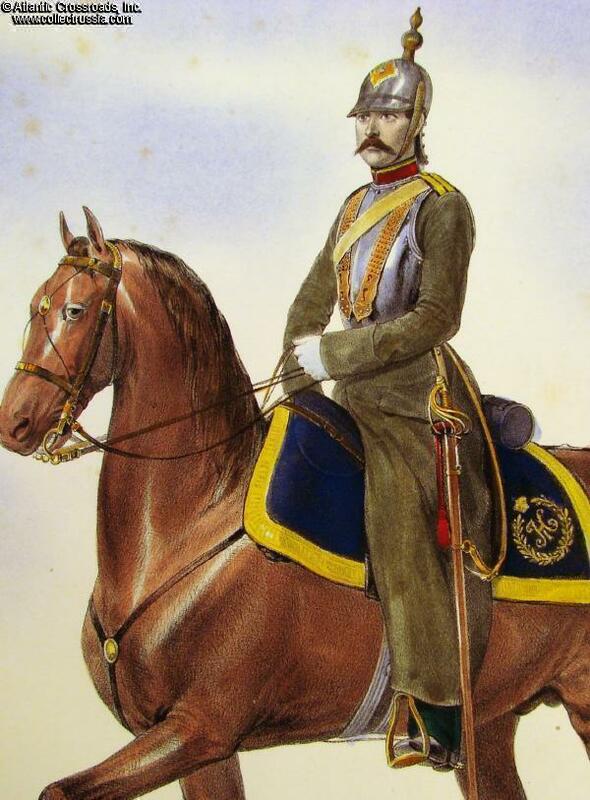 Hand colored lithograph (printed in Paris c 1855) illustrating a Russian company grade cavalry officer in winter uniform from the Cuirassier Regiment of the Military Order from the 1854-1855 period (#212 in a series), very fine condition, large format: 12 1/2" by 17" [32 X 43cm], image size: 7 1/8" by 9 ¾" [18 X 25cm], colors fresh as new with only minor foxing. Produced in France during the final years of the Crimean War (or shortly after that conflict ended), this beautifully executed lithograph was printed by the famous Parisian firm of (Joseph) Lemercier and subsequently meticulously hand colored, most likely by artists living in Russia who were able to work from color uniform references and cloth samples not readily available in France. Although about one hundred and fifty years old, the paper it is printed on shows no signs of brittleness and the colors are 'fresh as new.' Most of whatever minor foxing is present would be covered by a mat when finally framed for display in a living room or a study. 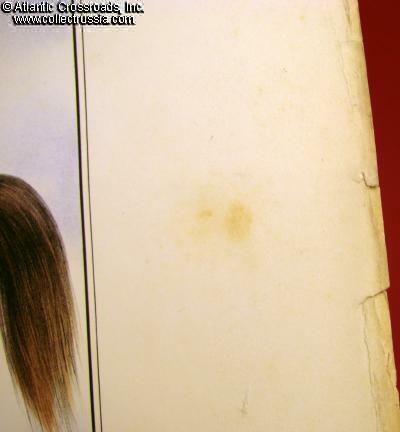 The same would hold true for any other minor imperfections in the border area (primarily minor edge crumpling). Please note the photographs. The background of this unit is quite interesting. The term "Military Order" in its title was bestowed upon it by Catharine the Great (and refers, of course, to the Order of St. George, Russia's highest award for military bravery during the Empire and now reinstituted as a valor award by the current Russian government). Originally founded by Peter the Great in the 17th century, the soldiers in this regiment were uniformed at various points as cuirassiers, at others, dragoons! 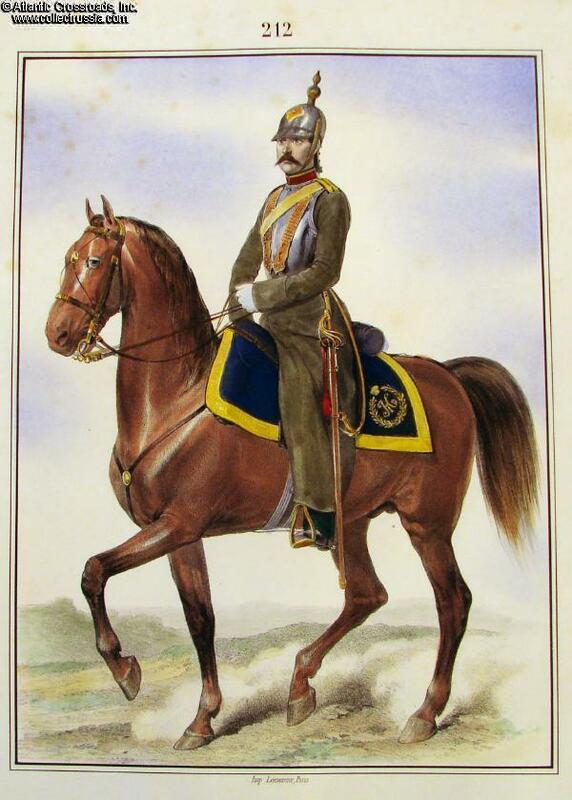 From 1907 until the Revolution, it was titled the 13th Dragoon Regiment. Besides the fact that this is a significant historic document in and of itself, it represents a rare and uniquely affordable opportunity for the collector of items related to the Russian Empire to own and display original nineteenth century artwork in his or her home.